Best. Beauty Show Moment. Ever. Posted by HarryPosted on August 27, 2007 Leave a comment on Best. Beauty Show Moment. Ever. Don’t you think Betty and Grampy pretty much figured out the proper response to all instances of cruelty to animals? Say, it’s time for a Sideways Comic Strip(tm). Return with us now to less than four months after Blondie‘s debut, when the Bumsteads were not yet the Bumsteads (well, Dagwood was one, but Blondie wasn’t), Dagwood had a blue-collar job working for his father, and the whole thing was better drawn, funnier, and generally more lively and charming than it would later become. And as far as I know, it was actually drawn by Chic Young. I’m visiting my nephew Gus (and his parents, Elizabeth and Edward) in Saratoga Springs, New York. 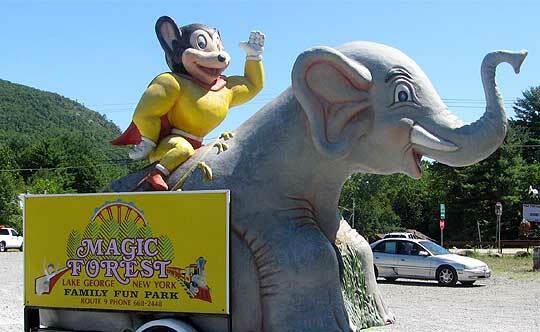 Yesterday, we visited nearby Lake George, where Mighty Mouse has found work sitting astride an elephant in a parking lot, beckoning motorists to visit a local amusement park.